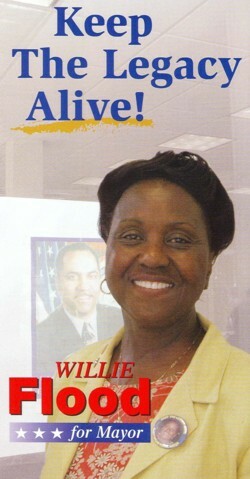 Hudson County Politics Message Board :: View topic - What ever happen to Willie Flood ? What ever happen to Willie Flood ? Posted: Thu Mar 01, 2007 3:31 pm Post subject: What ever happen to Willie Flood ? Willie really did so much for the community in the past. He is one hell of a guy, but I've haven't seen him around lately. Is he going to run for mayor or is he retired from politics? Posted: Fri Mar 02, 2007 12:03 am Post subject: Re: What ever happen to Willie Flood ? You do realize Willie Flood is a woman, right? Posted: Fri Mar 02, 2007 9:16 pm Post subject: Where's the Benz ? It's 9PM. Do you know where your drug dealing child is ?